Holiday time again. Many people stress out, wanting everything to be perfect. Others stress out due to family interactions — old and new. Almost everyone overspends their budget, another source of stress. It’s easy to tell yourself that you are going to be relaxed this year, but far harder to do it. Numerous studies demonstrate that the relaxation process is helped by connecting to the natural world. This is great news for us living here in the sunny southwest. Take a sanity break in your own back yard, and ideally, bring some of the nature outside into your home. Fill a vase with evergreen boughs. Prune your evergreens, or volunteer to do those of a neighbor. Pines such as Aleppo and Afghan pines are commonly sold as living Christmas trees and make lovely yard trees. They typically need little pruning (one of their attractions as a yard tree), but you may be able to find some branches that need trimming. Stores that sell fresh Christmas trees may let you have some trimmed boughs to decorate with. There are a number of other evergreen cousins. Trees and shrubs commonly called cypress, cedar and juniper were all typically planted in older neighborhoods. All will last a week or so in a vase. Try to find branches with the bright blue “berries.” Actually the “berries” are tiny cones, and the seeds inside are well loved by many local birds. Greens don’t have to be traditional holiday evergreens either. Technically, any plant that does not drop its leaves is an evergreen. Rosemary is evergreen, and it is related to mint. Citrus trees are evergreen, and make lovely additions to indoor arrangements. Pyracantha doesn’t lose it’s leaves in winter and is adorned with bright reddish berries right now. Nandina, also called heavenly bamboo has red berries and green leaves as well. The Texas mountain laurel tree is evergreen with silvery seed pods. One of my favorites to bring indoors is boughs of our native creosote bush. All of these will last at least a week in a vase and look very festive. Yule logs are a British Isles tradition. A mesquite log can take the place of a Christmas tree. Glitter can be sprinkled into the bark crevices. Use a drill to bore several holes for candles. Decorate with evergreens and bows. If you want to be traditional, the Yule log is burned on Epiphany, January 6th, or in an older tradition, on the Winter Solstice, December 21st. Do not burn the evergreens when it is time to light your Yule log. The evergreens are full of highly volatile oils and can cause a house fire instead. Above all, remember to relax and enjoy the season. Old expectations may rattle their chains and try to haunt you, but take it easy, and take it slow. Surround yourself with as much as possible with the natural world. When you start to feel stressed, take a deep breath, and rest and refresh your eyes and spirit with the beauty of nature. If you would like help with care and planting of your yard, I work as a “Garden Coach” helping you get the most out of your yard. Please contact me, Jacqueline, at 909-3474. Feel free to leave a voice message. 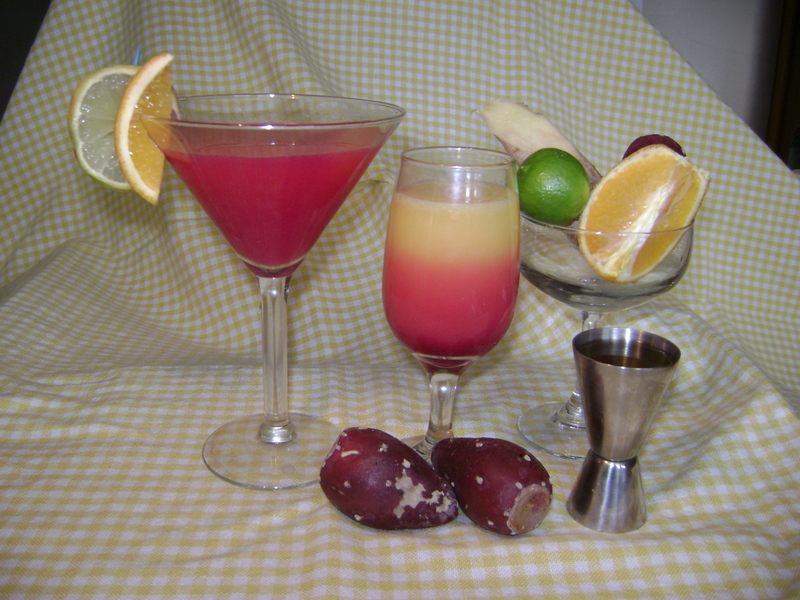 Welcome guests with tasty prickly pear cocktails. It’s Carolyn Niethammer here this week. First, I want to welcome all the new subscribers. I speak for my fellow bloggers when I say we are so happy to have you join this little community of food lovers. Please feel free to join in at any time with ideas and comments. Today I want to talk about using prickly pear syrup in holiday cocktails. We all know and love prickly pear margaritas, but there is a world beyond that beloved beverage. And these cocktails don’t have to include alcohol. In fact it is nice to be able to offer your non-drinking guests something tasty and sophisticated way beyond diet coke and seltzer with lime. There are several keys to delicious cocktails. One important ingredient is fresh juice. It makes a big difference and here in Arizona we have an easy abundance. Some of you need only walk as far as your backyard to grab a handful of oranges or tangelos. If you are using alcohol, you can choose vodka, tequila or rum. Make your prickly pear syrup. 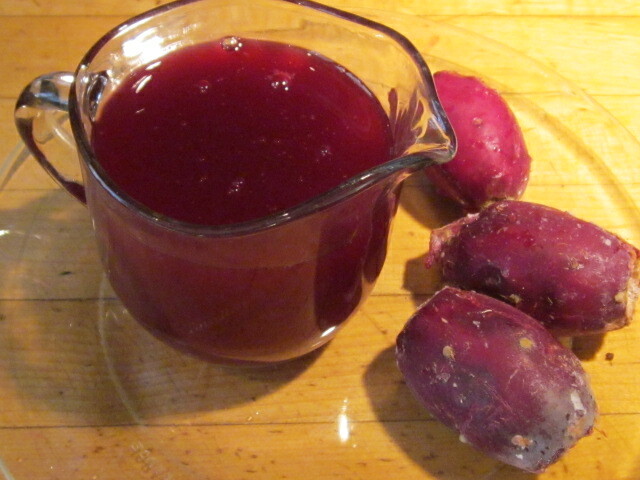 If you have stored some prickly pear juice in your freezer, make a syrup with 1 cup juice to 1 cup sugar. Simmer gently to evaporate some of the liquid. If you didn’t get around to storing any juice this year, there are several good commercial syrups made by local entrepreneurs. 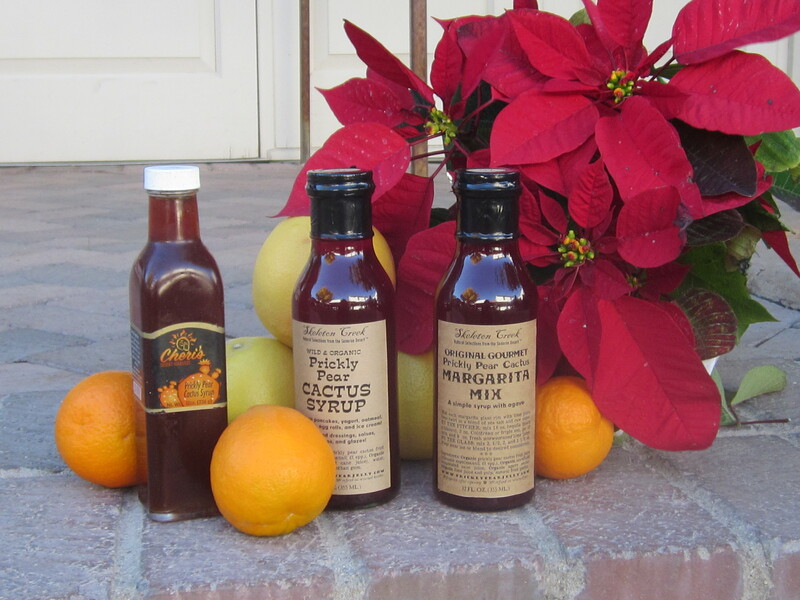 You can find Cheri’s Desert Harvest products widely in stores or on-line and Jeau Allen is at farmer’s markets with her products and they are available on-line. You can buy commerical syrup and a special prickly pear/lime blend. To elevate your cocktail with a more sophisticated flavor, you need to add a bitter or sharp flavor such as you get with ginger. To make ginger syrup, I grate a 5-inch piece of fresh ginger and simmer for 30 minutes in a cup of water. Strain out ginger and reduce liquid to a half cup. Add a half cup sugar or agave syrup and cook a few minutes to dissolve sugar. You can also add a few drops of bitters. Angostera bitters is the most available brand and they hold their recipe closely, but bitters is usually a blend of herbs and spices. You can find some recipes to make your own here and here. As a final step, top each glass with a little flavored sparkling soda. Here are some recipes to get you started. Then experiment. Fill glass with ice. Pour 3/4 full of fresh orange juice. Add a shot of tequila or rum and a tablespoon of ginger syrup. Add two tablespoons of prickly pear syrup. It will sink to the bottom and look like one of our gorgeous sunsets (see picture at top of blog). Combine all in a blender and serve in a glass with a swizzle stick speared onto a chunk of pineapple. Combine first four ingredients and pour over ice in large wine glass. Top with cranberry soda. Garnish with lime wedge or circle on glass edge. Want more prickly pear recipes? Take at look at The Prickly Pear Cookbook. Available at Native Seeds Search, The Tucson Botanical Gardens, your local bookstore or on-line here. Heirloom Beans for Holiday Feasts! 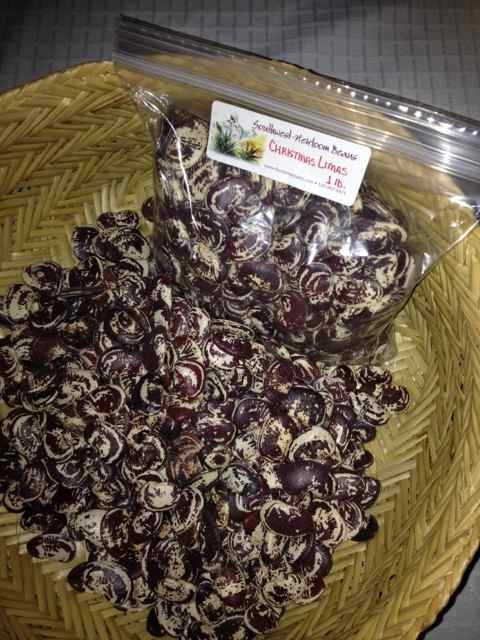 Among beans, Christmas Lima is a giant not only in size but in flavor! This heirloom Phaseolus lunatus is dramatic mottled purple and white, and lends itself to many colorful dishes. Try a holiday tip from the Heirloom Bean Queen “Tia Pan Dulce”—sure to please vegetarian and omnivore alike: Curried Christmas Limas! The evening before cooking, sort and wash ½ lb of dry Christmas Limas. Presoak overnight in plenty of water (at least a qt) as they will swell. Next day give remaining water to your compost and add a qt of fresh drinking water. Simmer limas without salt until they test tender (1 ½-2hrs stove top; 2-3hrs solar oven; 3-5 hrs crock pot). Some people prefer them al dente. I like them soft and done through but not mushy. Reserve the bean liquid. Add cooked limas to the veggie curry stir-fry adding either veggie stock or the reserved bean liquid as needed. Simmer on low heat until flavors are blended (about 1/2 hr) and salt to taste. Serve with brown rice or polenta for a complete protein complement. If you want to GROW Christmas limas for yourself, save a few seed out of the bag you find at Sunday’s Heirloom farmers’ market or at the Native Seeds/SEARCH store (3061 N Campbell, Tucson). Plant them in April where they can vine their way up a trellis in dappled light or into a low-growing tree. They are long-season, so plan on tending them thru heat of May and June until the monsoons give them a boost. You will be climbing the tree or trellis to harvest big pods in the fall, ready for homegrown holiday cookery next year. 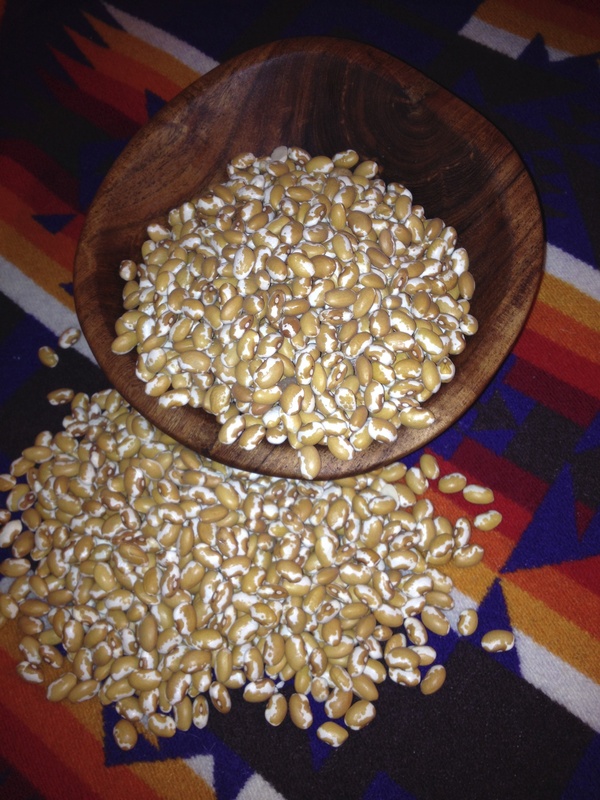 An important heirloom for the season– used by Native cultures of the Southwest since time-immemorial to celebrate the Winter Solstice—is the festive yellow and white Four Corners Gold Bean (aka Zuni Gold). It will lend itself to any hearty dish you may want to have simmering in a crock pot ready to drive off any chill from ski-ing, hiking, cycling, or dog-walking thru these short wintry days. Try them in a bean soup with an oxtail from Jojoba Beef at the farmers’ market; or as chile beans with Native Seeds/SEARCH’s amazing chilpotle chile powder; or as a dip mashed with a Tarahumara bean masher, dashes of Red Devil tabasco sauce and 1 tsp of cumin powder. My grandmother always served us black-eyed peas for New Year’s telling us grandkids that the number of them we ate was the number of dollars we would make in the new year. In her tradition of black-eyed peas, as New Year’s approaches, I like to fix a Southwestern version of black-eyes: Moon Beans! 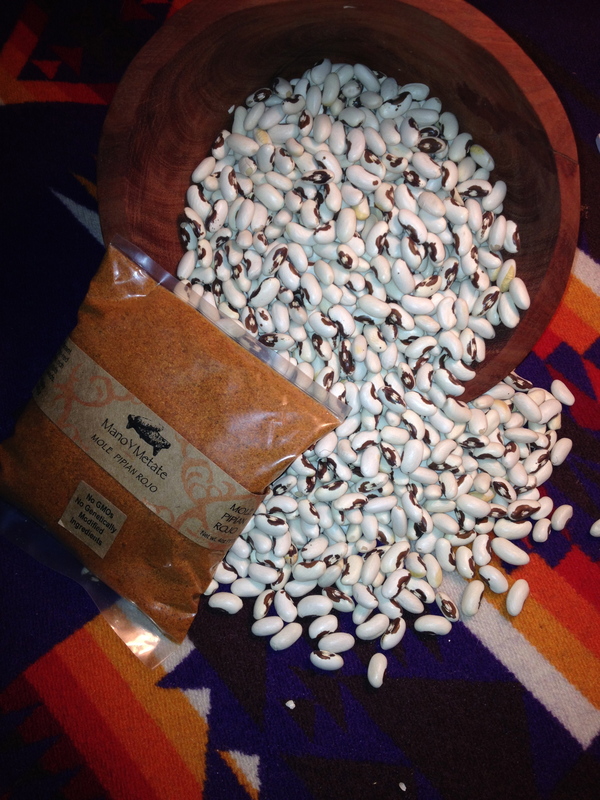 For a festive flavor try moon beans with pipian rojo mole as a centerpiece dish, adding the prepared mole powder from Mano y Metate in the last half hour of bean cooking. Solar-cooked Moon Beans can be downright celestial. If December 30 or 31 is going to be sunny, and if you know you will be “hanging out” available for re-orienting your solar oven every ½ hour or hour, soak your Moon Beans the night before, change the water next day, and in a saucepan with plenty of drinking water add a ham hock and/or chopped onions and veggies to your Moon Beans. A few hours of solar cookery will provide a New Year’s home-made feast worth a million dollars. It is early winter, and as the days become shorter, things slow down in the natural world. Egg laying is noticeably slower. Honeybee brood cycles are are scaled way back; the drones having been cast out (weeks ago) to preserve the resources of the hive. Our cattle are moved to winter pasture; and while we could keep a few cows near the house for milk/cheese, we prefer to let the girls rest after the rough (read: drought) summer here. Not taking milk allows the cows a chance to rest and recondition. This slowing down is a part of regeneration. Humans, often forgetting our animal nature, can be out of sync with the rythms of particular seasons – especially the slower more inward season that we are in now. We continue the ceaseless output of energy that culture demands, as if it were perpetual spring – energy bursting upward and outward, rather than inward and in to our metaphorical roots. . We are a part of the animal, insects, and plant kingdoms with which we live. And seasons, with their increase and decrease in light and energy, offer different things to us. The winter kitchen is one of the few places where we can enjoy the slowness of this season, because winter meals often take time to simmer or bake. We are nearing the winter solstice, which occurs between December 20th and the 23rd , wrapping the animals, insects, and plants, living on this side of the planet, in darkness. This recipe for Super-Slow-Roasted Rosemary-Crusted Chuck Steak, from Shannon Hayes’s THE GRASSFED GOURMET COOKBOOK is a flavorful way to both practice and delight in the Slowness of the Season. And precisely because it T A K E S T I M E, the flavors have time to mingle sensuously, another perk of the cold season. More oddly, I feel it gives kitchens – sometimes forgotten as the “heart” of the home – a chance to embody their mission. Cooking meals slowly allows the kitchen to warm the home from the kitchen outward; you may find that family and friends linger a little longer, basking in the aromas and warmth and heartbeat. Forgive me for saying it, but I think I hear the kitchen smiling. Cover loosely with plastic wrap and let rest for 30-60 minutes. Roast the meat in a shallow pan for 30 minutes, then lower the oven temperature to 170 degrees F. Continue to roast for 4-6 hours, (depending on the weight the larger the cut the longer it takes to roast), or until an internal meat thermometer registers 120 F to 125 F. Hayes suggests that you do not cook it beyond 125F or you will loose tenderness. And in keeping with the Spirit of Slow: allow the meat to rest (with loose foil tented) for 5- 10 minutes before slicing. *** Garlic-Rosemary Rub: 2 Tablespoons of dried Rosemary, 1 clove garlic, minced, 1 ½ Tablespoons coarse salt, 2 Teaspoons freshly ground black pepper. Note: I cannot recommend Shannon Hayes, The Grassfed Gourmet Cookbook enough. It will likely change the way you look at farming, flavors, and how they/we are connected. * If you are a veggie/vegan try slow roasting winter’s roots vegetables with the oil of your choice and the same spices in the rub, but do not cook them as long, just till as tender and as flavorful as you love. Please note: The photos were taken by me to share with you; I would love it if you would please leave them here (and not abscond with them to other parts of the internet). Thank you so much.